Stop Us Before We Slurp Again | What Would The Founders Think? Mayor Michael Bloomberg has determined that New Yorkers are not bright enough to make the critical decision of how much soda to buy. He and the calorie cops at the New York City Board of Health are on the scene. Clearly, New Yorkers collectively clamored, “Stop us before we slurp again!” No sodas larger than sixteen ounces can be purchased, if Bloomberg gets his way. All in the name moderation – and Bloomberg is all about moderation. Just ask him. But Bloomberg says he isn’t stopping anyone from getting as much soda as they want. If someone wants thirty two ounces of soda, they can get two 16-ounce cups, or four 8-ounce cups, or sixteen 2-ounce cups, or thirty two 1-ounce cups. Bloomberg doesn’t want to appear unreasonable. Of course, should someone want a sixty four ounce drink…wait, let me get my calculator. Many believe that the bigger the government, the smaller the citizen. This is undoubtedly true. 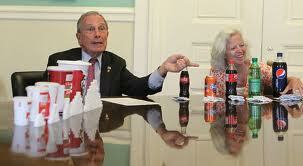 Mayor Bloomberg also believes the bigger the government, the smaller the soda. Not to be outdone in the moderation department, some members of the New York City Board of Health want to limit popcorn and milk. Milk leads to milkshakes and how many milkshake drinkers could have been stopped if only they had not been introduced to milk at an early age? But, really, I’m all in with moderation so we shouldn’t stop there – let’s ban cows. If you want to limit milk consumption, shouldn’t you stop it at the source? Not only that, but we can get a two-fer – no milk and no red meat. (Actually, a three-fer, since we would also be eliminating the ozone-depleting cow flatulence.) And then, Bloomberg should ban breast milk, recent Newsweek cover stories notwithstanding. Continuing with the moderation theme, it is clear that a large amount of popcorn consumption occurs while movie watching. 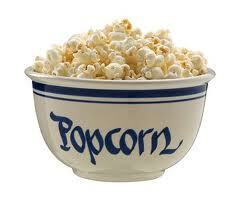 As movie viewing leads to popcorn consumption (a clear cause and effect), shouldn’t movies be banned? And since microwaves are the primary method by which popcorn is cooked at home, those should also be banned. Don’t you just love moderation? Now that we’ve got that settled, I’m going to sit down and watch the movie Escape From New York on cable with some popcorn and 32-ounce soda in hand. I live in Arizona. Curtice Mang is the author of the new book, The Constitution – I’m Not Kidding and Other Tales of Liberal Folly. He can be contacted at www.mangwrites.com, where one can also purchase his book; or contact Curtice at mangwrites at cox.net. And since we all know that all that moderation will work out soooo well in the Big Apple, it must be good for the whole country. So President Obama will side step that pesky old Congress once again and declare by executive order that feeding children, sodas, chips, candy, and cookies, is a form of child abuse and the evil parents who do this to their children should be arrested. Oh, it’s still moderation, he won’t ban these foods for everyone, just children. I know, I’m being sarcastic, but hey! It could happen! Hey, great article. I hope to read many more at WWTFT. Thanks. I’ll be posting articles here from time to time as well as on my website. Different ones for each site most likely, although longer ones here. I’ve got a few up now one my site if you want to take a look sometime.